Asteraceae or Compositae (commonly referred to as the aster, daisy, composite, or sunflower family) is a very large and widespread family of flowering plants (Angiospermae). The family currently has 32,913 accepted species names, in 1,911 genera (list) and 13 subfamilies. In terms of numbers of species, the Asteraceae are rivaled only by the Orchidaceae. (Which of the two families is actually larger is unclear, owing to uncertainty about exactly how many species exist in each family.). Nearly all members bear their flowers in dense heads (capitula or pseudanthia) surrounded by involucral bracts. When viewed from a distance, each capitulum may have the appearance of being a single flower. Enlarged outer (peripheral) flowers in the capitula may resemble petals, and the involucral bracts may look like a calyx. The name Asteraceae comes from the type genus Aster, from the Ancient Greek ἀστήρ, meaning star, and refers to the star-like form of the inflorescence. Compositae is an older (but still valid) name that refers to the "composite" nature of the capitula, which consist of (few to) many individual flowers. Most members of Asteraceae are annual or perennial herbs, but a significant number are also shrubs, vines, or trees. The family has a worldwide distribution, from the polar regions to the tropics, colonizing a wide variety of habitats. It is most common in the arid and semiarid regions of subtropical and lower temperate latitudes, . The Asteraceae may represent as much as 10% of autochthonous flora in many regions of the world. Asteraceae is an economically important family, providing products such as cooking oils, lettuce, sunflower seeds, artichokes, sweetening agents, coffee substitutes and herbal teas. Several genera are of horticultural importance, including pot marigold, Calendula officinalis, Echinacea (cone flowers), various daisies, fleabane, chrysanthemums, dahlias, zinnias, and heleniums. Asteraceae are important in herbal medicine, including Grindelia, yarrow, and many others. A number of species are considered invasive, including, most notably in North America, dandelion, which was originally introduced by European settlers who used the young leaves as a salad green. The study of this family is known as synantherology. The name Asteraceae (English: /ˌæstəˈreɪsi, -siˌaɪ, -siˌeɪ, -siˌiː/) comes to international scientific vocabulary from New Latin, from Aster, the type genus, + -aceae, a standardized suffix for plant family names in modern taxonomy. The genus name comes from the Classical Latin word aster, "star", which came from Ancient Greek ἀστήρ (astḗr), "star". Compositae (an alternative name) means "composite" and refers to the characteristic inflorescence, a special type of pseudanthium found in only a few other angiosperm families. The vernacular name daisy, widely applied to members of this family, is derived from the Old English name of the daisy (Bellis perennis): dæġes ēaġe, meaning "day's eye". This is because the petals open at dawn and close at dusk. 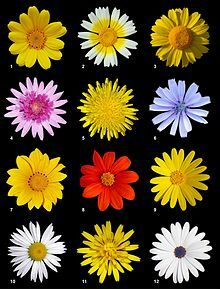 Asteraceae species have a cosmopolitan distribution, and are found everywhere except Antarctica and the extreme Arctic. They are especially numerous in tropical and subtropical regions (notably Central America, eastern Brazil, the Mediterranean, the Levant part of the Middle East, southern Africa, central Asia, and southwestern China). Compositae, the original name for Asteraceae, were first described in 1792 by the German botanist Paul Dietrich Giseke. Traditionally, two subfamilies were recognised: Asteroideae (or Tubuliflorae) and Cichorioideae (or Liguliflorae). The latter has been shown to be extensively paraphyletic, and has now been divided into 12 subfamilies, but the former still stands. The phylogenetic tree presented below is based on Panero & Funk (2002) updated in 2014, and now also includes the monotypic Famatinanthoideae. The diamond denotes a very poorly supported node (<50% bootstrap support), the dot a poorly supported node (<80%). Barnadesioideae: 9 genera, 93 species. South America, mainly the Andes. Famatinanthoideae: South America, 1 genus, 1 species. Mutisioideae: 58 genera, 750 species. Absent from Europe, mostly in South America. Stifftioideae: 10 genera. South America. Gochnatioideae: 4 or 5 genera, 90 species. Hecastocleidoideae: Only Hecastocleis shockleyi. Southwestern United States. Carduoideae: 83 genera, 2,500 species. Worldwide. Cichorioideae: 224 genera, 3,200 species. Worldwide. Corymbioideae: Only the genus Corymbium, with 9 species. Asteroideae: 1,130 genera and 16,200 species. Worldwide. It is noteworthy that the four subfamilies Asteroideae, Cichorioideae, Carduoideae and Mutisioideae contain 99% of the species diversity of the whole family (approximately 70%, 14%, 11% and 3% respectively). Because of the morphological complexity exhibited by this family, agreeing on generic circumscriptions has often been difficult for taxonomists. As a result, several of these genera have required multiple revisions. Members of the Asteraceae are mostly herbaceous plants, but some shrubs, climbers and trees (such as Lachanodes arborea) do exist. They are generally easy to distinguish from other plants, mainly because of their characteristic inflorescence and other shared characteristics. However, determining genera and species of some groups such as Hieracium is notoriously difficult (see "damned yellow composite" for example). Members of the Asteraceae generally produce taproots, but sometimes they possess fibrous root systems. Stems are herbaceous aerial branched cylindrical with glandular hairs generally erect but can be prostrate to ascending. Some species have underground stems in the form of caudices or rhizomes. These can be fleshy or woody depending on the species. The leaves and the stems very often contain secretory canals with resin or latex (particularly common among the Cichorioideae). The leaves can be alternate, opposite, or whorled. They may be simple, but are often deeply lobed or otherwise incised, often conduplicate or revolute. The margins can be entire or lobed or toothed. In plants of the family Asteraceae, what appears to be a single flower is actually a cluster of much smaller flowers. The overall appearance of the cluster, as a single flower, functions in attracting pollinators in the same way as the structure of an individual flower in some other plant families. 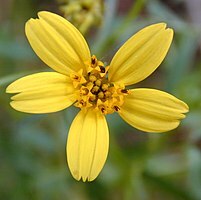 The older family name, Compositae, comes from the fact that what appears to be a single flower is actually a composite of smaller flowers. The "petals" or "sunrays" in a sunflower head are actually individual strap-shaped flowers called "ray flowers", and the "sun disk" is made of smaller circular shaped individual flowers called "disc flowers". The word "aster" means "star" in Greek, referring to the appearance of some family members, as a "star" surrounded by "rays". The cluster of flowers that may appear to be a single flower, is called a head. The entire head may move tracking the sun, like a "smart" solar panel, which maximizes reflectivity of the whole unit and can thereby attract more pollinators. At the base of the head, and surrounding the flowers before opening, is a bundle of sepal-like bracts or scales called phyllaries, which together form the involucre that protects the individual flowers in the head before opening. The individual heads have the smaller individual flowers arranged on a round or dome-like structure called the receptacle. The flowers mature first at the outside, moving toward the center, with the youngest in the middle. The individual flowers in a head have 5 fused petals (rarely 4), but instead of sepals, have threadlike, hairy, or bristly structures called pappus, which surround the fruit and can stick to animal fur or be lifted by wind, aiding in seed dispersal. The whitish fluffy head of a dandelion, commonly blown on by children, is made of the pappus, with tiny seeds attached at the ends, whereby the pappus provides a parachute like structure to help the seed be carried away in the wind. A ray flower is a 3-tipped (3-lobed), strap-shaped, individual flower in the head of some members of the family Asteraceae. Sometimes a ray flower is 2-tipped (2-lobed). The corolla of the ray flower may have 2 tiny teeth opposite the 3-lobed strap, or tongue, indicating evolution by fusion from an originally 5-part corolla. Sometimes, the 3:2 arrangement is reversed, with 2 tips on the tongue, and 0 or 3 tiny teeth opposite the tongue. A ligulate flower is a 5-tipped, strap-shaped, individual flower in the heads of other members. A ligule is the strap-shaped tongue of the corolla of either a ray flower or of a ligulate flower. A disk flower (or disc flower) is a radially symmetric (i.e., with identical shaped petals arranged in circle around the center) individual flower in the head, which is ringed by ray flowers when both are present. Sometimes ray flowers may be slightly off from radial symmetry, or weakly bilaterally symmetric, as in the case of desert pincushions Chaenactis fremontii. A radiate head has disc flowers surrounded by ray flowers. A ligulate head has all ligulate flowers. When a sunflower family flower head has only disc flowers that are sterile, male, or have both male and female parts, it is a discoid head. Disciform heads have only disc flowers, but may have two kinds (male flowers and female flowers) in one head, or may have different heads of two kinds (all male, or all female). Pistillate heads have all female flowers. Staminate heads have all male flowers. Sometimes, but rarely, the head contains only a single flower, or has a single flowered pistillate (female) head, and a multi-flowered male staminate (male) head. The distinguishing characteristic of Asteraceae is their inflorescence, a type of specialised, composite flower head or pseudanthium, technically called a calathium or capitulum, that may look superficially like a single flower. The capitulum is a contracted raceme composed of numerous individual sessile flowers, called florets, all sharing the same receptacle. A set of bracts forms an involucre surrounding the base of the capitulum. These are called "phyllaries", or "involucral bracts". They may simulate the sepals of the pseudanthium. These are mostly herbaceous but can also be brightly coloured (e.g. Helichrysum) or have a scarious (dry and membranous) texture. The phyllaries can be free or fused, and arranged in one to many rows, overlapping like the tiles of a roof (imbricate) or not (this variation is important in identification of tribes and genera). Each floret may be subtended by a bract, called a "palea" or "receptacular bract". These bracts are often called "chaff". The presence or absence of these bracts, their distribution on the receptacle, and their size and shape are all important diagnostic characteristics for genera and tribes. The florets have five petals fused at the base to form a corolla tube and they may be either actinomorphic or zygomorphic. Disc florets are usually actinomorphic, with five petal lips on the rim of the corolla tube. The petal lips may be either very short, or long, in which case they form deeply lobed petals. The latter is the only kind of floret in the Carduoideae, while the first kind is more widespread. Ray florets are always highly zygomorphic and are characterised by the presence of a ligule, a strap-shaped structure on the edge of the corolla tube consisting of fused petals. In the Asteroideae and other minor subfamilies these are usually borne only on florets at the circumference of the capitulum and have a 3+2 scheme — above the fused corolla tube, three very long fused petals form the ligule, with the other two petals being inconspicuously small. The Cichorioideae has only ray florets, with a 5+0 scheme — all five petals form the ligule. A 4+1 scheme is found in the Barnadesioideae. The tip of the ligule is often divided into teeth, each one representing a petal. Some marginal florets may have no petals at all (filiform floret). The calyx of the florets may be absent, but when present is always modified into a pappus of two or more teeth, scales or bristles and this is often involved in the dispersion of the seeds. As with the bracts, the nature of the pappus is an important diagnostic feature. There are usually five stamens. The filaments are fused to the corolla, while the anthers are generally connate (syngenesious anthers), thus forming a sort of tube around the style (theca). They commonly have basal and/or apical appendages. Pollen is released inside the tube and is collected around the growing style, and then, as the style elongates, is pushed out of the tube (nüdelspritze). The pistil consists of two connate carpels. The style has two lobes. Stigmatic tissue may be located in the interior surface or form two lateral lines. The ovary is inferior and has only one ovule, with basal placentation. In members of the Asteraceae the fruit is achene-like, and is called a cypsela (plural cypselae). Although there are two fused carpels, there is only one locule, and only one seed per fruit is formed. It may sometimes be winged or spiny because the pappus, which is derived from calyx tissue often remains on the fruit (for example in dandelion). In some species, however, the pappus falls off (for example in Helianthus). Cypsela morphology is often used to help determine plant relationships at the genus and species level. The mature seeds usually have little endosperm or none. In Asteraceae, the energy store is generally in the form of inulin rather than starch. They produce iso/chlorogenic acid, sesquiterpene lactones, pentacyclic triterpene alcohols, various alkaloids, acetylenes (cyclic, aromatic, with vinyl end groups), tannins. They have terpenoid essential oils which never contain iridoids. Asteraceae produce secondary metabolites, such as flavonoids and terpenoids. Some of these molecules can inhibit protozoan parasites such as Plasmodium, Trypanosoma, Leishmania and parasitic intestinal worms, and thus have potential in medicine. The oldest known fossils of members of Asteraceae are pollen grains from the Late Cretaceous of Antarctica, dated to ∼76–66 Mya (Campanian to Maastrichtian) and assigned to the extant genus Dasyphyllum. Barreda, et al. (2015) estimated that the crown group of Asteraceae evolved at least 85.9 Mya (Late Cretaceous, Santonian) with a stem node age of 88-89 Mya (Late Cretaceous, Coniacian). It is still unknown whether the precise cause of their great success was the development of the highly specialised capitulum, their ability to store energy as fructans (mainly inulin), which is an advantage in relatively dry zones, or some combination of these and possibly other factors. Asteraceans are especially common in open and dry environments. Many members of Asteraceae are pollinated by insects, which explains their value in attracting beneficial insects, but anemophily is also present (e.g. Ambrosia, Artemisia). There are many apomictic species in the family. Seeds are ordinarily dispersed intact with the fruiting body, the cypsela. Anemochory (wind dispersal) is common, assisted by a hairy pappus. Epizoochory is another common method, in which the dispersal unit, a single cypsela (e.g. Bidens) or entire capitulum (e.g. Arctium) has hooks, spines or some structure to attach to the fur or plumage (or even clothes, as in the photo) of an animal just to fall off later far from its mother plant. Commercially important plants in Asteraceae include the food crops Lactuca sativa (lettuce), Cichorium (chicory), Cynara scolymus (globe artichoke), Helianthus annuus (sunflower), Smallanthus sonchifolius (yacón), Carthamus tinctorius (safflower) and Helianthus tuberosus (Jerusalem artichoke). Plants are used as herbs and in herbal teas and other beverages. Chamomile, for example, comes from two different species: the annual Matricaria chamomilla (German chamomile) and the perennial Chamaemelum nobile (Roman chamomile). Calendula (known as pot marigold) is grown commercially for herbal teas and potpourri. Echinacea is used as a medicinal tea. The wormwood genus Artemisia includes absinthe (A. absinthium) and tarragon (A. dracunculus). Winter tarragon (Tagetes lucida), is commonly grown and used as a tarragon substitute in climates where tarragon will not survive. Many members of the family are grown as ornamental plants for their flowers, and some are important ornamental crops for the cut flower industry. Some examples are Chrysanthemum, Gerbera, Calendula, Dendranthema, Argyranthemum, Dahlia, Tagetes, Zinnia, and many others. Members of the family are also commonly featured in medical and phytochemical journals because the sesquiterpene lactone compounds contained within them are an important cause of allergic contact dermatitis. Allergy to these compounds is the leading cause of allergic contact dermatitis in florists in the US. Pollen from ragweed Ambrosia is among the main causes of so-called hay fever in the United States. Asteraceae are also used for some industrial purposes. Marigold (Tagetes patula) is common in commercial poultry feeds and its oil is extracted for uses in cola and the cigarette industry. Several members of the family are copious nectar producers and are useful for evaluating pollinator populations during their bloom. Centaurea (knapweed), Helianthus annuus (domestic sunflower), and some species of Solidago (goldenrod) are major "honey plants" for beekeepers. Solidago produces relatively high protein pollen, which helps honey bees over winter. Some members of Asteraceae are economically important as weeds. Notable in the United States are Senecio jacobaea (ragwort), Senecio vulgaris (groundsel), and Taraxacum (dandelion). The genera Chrysanthemum, Pulicaria, Tagetes, and Tanacetum contain species with useful insecticidal properties. Parthenium argentatum (guayule) is a source of hypoallergenic latex. ^ a b c Viviana D. Barreda; Luis Palazzesi; Maria C. Tellería; Eduardo B. Olivero; J. Ian Raine; Félix Forest (2015). "Early evolution of the angiosperm clade Asteraceae in the Cretaceous of Antarctica". Proceedings of the National Academy of Sciences of the United States of America. 112 (35): 10989–10994. doi:10.1073/pnas.1423653112. PMC 4568267. PMID 26261324. ^ "Asteraceae Bercht. & J. Presl". Tropicos. Missouri Botanical Garden. Retrieved 14 July 2017. ^ "Family: Asteraceae Bercht. & J. Presl, nom. cons". Germplasm Resources Information Network (GRIN). USDA, ARS, National Genetic Resources Program, National Germplasm Resources Laboratory, Beltsville, Maryland. Retrieved 12 June 2008. ^ a b c d e P.F. Stevens (2001). "Angiosperm Phylogeny Website". Angiosperm Phylogeny Website. ^ "The Plant List: Compositae". Royal Botanic Gardens Kew and Missouri Botanic Garden. Retrieved 18 November 2016. ^ a b "International Code of Nomenclature for algae, fungi, and plants – Article 18.5". iapt-taxon.org. ^ a b Barkley, Theodore M.; Brouillet, Luc; Strother, John L. "Asteraceae". In Flora of North America Editorial Committee (ed.). Flora of North America North of Mexico (FNA). 19, 20 and 21. New York and Oxford – via eFloras.org, Missouri Botanical Garden, St. Louis, MO & Harvard University Herbaria, Cambridge, MA. ^ "Phytochemical and Ethnobotanical Databases". ars-grin.gov. ^ "dandelion Taraxacum officinale". Invasive Plant Atlas of the United States. Retrieved 10 September 2012. ^ a b Merriam-Webster, Merriam-Webster's Unabridged Dictionary, Merriam-Webster. ^ Panero, J.L. ; Funk, V.A. (2002). "Toward a phylogenetic subfamilial classification for the Compositae (Asteraceae)". Proc. Biol. Soc. Wash. 115: 909–922. ^ a b Panéro, José J.; Freire, Susana E.; Ariza Espinar, Luis; Crozier, Bonnie S.; Barboza, Gloria E.; Cantero, Juan J. (2014). "Resolution of deep nodes yields an improved backbone phylogeny and a new basal lineage to study early evolution of Asteraceae". Molecular Phylogenetics and Evolution. 80 (1): 43–53. doi:10.1016/j.ympev.2014.07.012. Retrieved 3 January 2017. ^ Zhi-Xi Fu; Bo-Han Jiao; Bao Nie; Tiangang Gao (2016). "A comprehensive generic‐level phylogeny of the sunflower family: Implications for the systematics of Chinese Asteraceae". Journal of Systematics and Evolution. 54 (4): 416–437. doi:10.1111/jse.12216. Retrieved 23 January 2017. ^ Funk, Vicki A.; Fragman-Sapir, Ori (2009). "22. Gymnarrheneae (Gymnarrhenoideae)". In V.A. Funk; A. Susanna; T. Stuessy; R. Bayer (eds.). Systematics, Evolution, and Biogeography of Compositae (PDF). Vienna: International Association for Plant Taxonomy. pp. 327–332. Retrieved 27 December 2016. ^ a b c d Judd, W.S., Campbell, C.S., Kellogg, E.A., Stevens, P.F. (2007) Plant Systematics: A Phylogenetic Approach. Sinauer Associates, Sunderland. ^ Beentje, Henk (2010). The Kew Plant Glossary, an illustrated dictionary of plant terms. Richmond, U.K.: Kew Publishing. ISBN 9781842464229. ^ McKenzie, R.J.; Samuel, J.; Muller, E.M.; Skinner, A.K.W. ; Barker, N.P. (2005). "Morphology Of Cypselae In Subtribe Arctotidinae (Compositae–Arctotideae) And Its Taxonomic Implications". Annals of the Missouri Botanical Garden. 92 (4): 569–594. JSTOR 40035740. ^ a b Panda, Sujogya Kumar; Luyten, Walter (2018). "Antiparasitic activity in Asteraceae with special attention to ethnobotanical use by the tribes of Odisha, India". Parasite. 25: 10. doi:10.1051/parasite/2018008. ISSN 1776-1042. PMC 5847338. PMID 29528842. ^ Odom, R.B. ; James, W.D. ; Berger, T.G. (2000). Andrews' Diseases of the Skin: Clinical Dermatology. W.B. Saunders Company. pp. 1135 pages. ISBN 0-7216-5832-6. Wikimedia Commons has media related to Asteraceae.